We have been recording videos and webinars for some time now and once in a while you get the change to interview someone who has made a significant difference in our industry…this is one of those occasions. Les Zellan’s love affair with Cooke started in 1981 when he made a visit to their Leicester factory and instinctively knew something special was waiting to be developed. After that first visit Les decided to buy the company and the rest as they say is history. Perhaps the pinnacle and reward for all the blood sweat and tears that followed culminated in 2013, when the Academy of Motion Picture Arts and Sciences recognised Cooke with a Science and Technology Oscar for helping define the look of motion pictures over the last century. 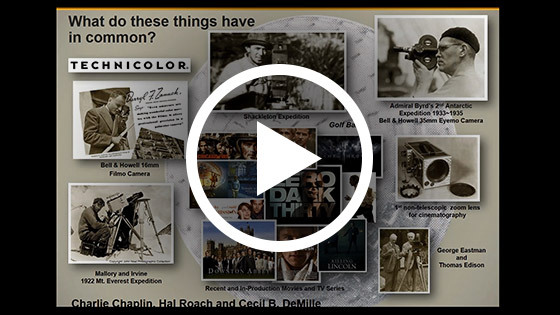 In this fascinating webinar Cooke Chairman Les Zellan explores the history, the art and the science of optics, photography and filmmaking. He discusses ‘glass’ choices, the famous ‘Cooke Look’ and how in the digital world perfection is not always what filmmakers want. Les will also touch on his predictions for the future including 8k, full frame and beyond. Whatever you think about Cooke lenses this is a unique piece of history from someone who has dedicated his life to the TV and film industry and well worth 60 mins of your time.